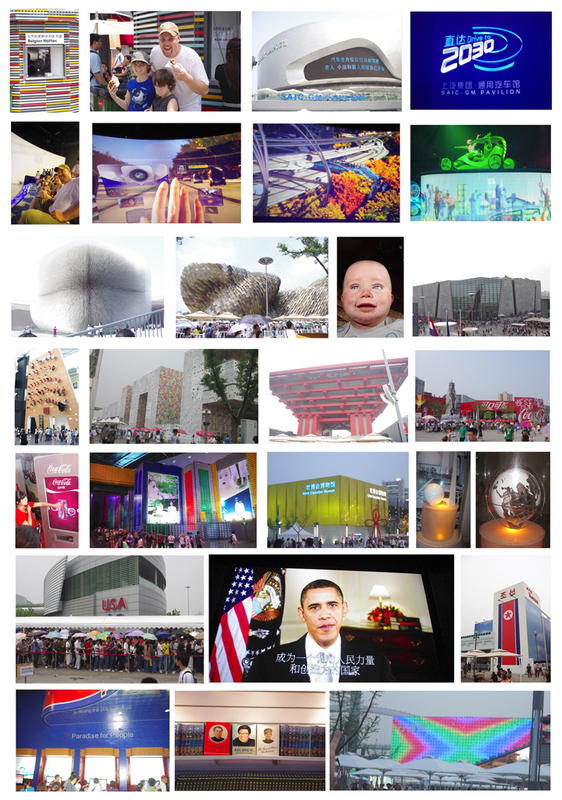 After years of study and research, writing about them, collecting memorabilia, and sharing in their legend and lore with PTU/WFC pals like you-- I'm excited to say that I've just returned from my very first World's Fair... EXPO 2010 in Shanghai. During a three week adventure across China, my family and I devoted three days to visiting the EXPO-- and it was nothing short of incredible. The daily crowds averaged around 600,000-- and the queue times were anywhere from 1 to 6 hours for each Pavilion-- but I'm proud to say we still managed to actually visit 14 Pavilions and saw dozens more. In truth, you could probably spend well over a week and still not see the entire massive fairgrounds. Our favorites were the UK Pavilion (known as "The Seed Cathedral," a stunning structure comprised of 60,000 fiber optic tubes which each contained seeds from around the world at the core), the Spain Pavilion (which featured a three-story, amazingly lifelike robotic baby which giggled and cooed at the crowd), and GM's Futurama 3, which took visitors on a virtual "Drive to 2030." The Italian Pavilion showcased sports cars, wine, fashion (including a haberdashery where Italian designers made suits behind glass), and a wall-mounted symphony. The Korean Pavilion was quite enchanting as well, with the appearance of having been laser cut from paper. Coca Cola gave each visitor a complimentary collectible mini-bottle of Coke and had several of the latest computerized vending machines available to try. The Urbania Pavilion exhibited the various ways that families live in cities around the world and featured beautiful cityscapes constructed of recyclaed materials. The theme center China Pavilion was as enormous in a relative sense as the EXPO itself; seven stories tall with only 50,000 people admitted daily due to heavy demand. And there was even a World Exposition Museum on the grounds which had exhibits about many of our favorite past fairs. In spite of its last minute construction and somewhat uninspired architectural design, the USA Pavilion did feature a rather sweet and moving film about the can-do spirit of an American girl trying to plant a garden in the inner city. And there were also special messages from both President Obama and Secretary of State Clinton. On the other end of the spectrum-- the North Korean Pavilion called itself "Paradise for People," featuring tacky rainbows, fountains, and literature from their exalted leader. So there was something for everyone-- even Kim Jong Il. And don't even get me started about how the whole place lit up at night. Wow. Just wow. Below are just a few photos I pasted together of the things I've mentioned in this post. If there's a specific Pavilion you'd like to see-- please don't hesitate to ask and chances are I have a pic I'd be happy to post. Simply put, it was an unforgettable, immense, exhausting, and intensely imaginative experience beyond my wildest dreams; three days my family and I will truly always treasure. Glad to hear your family had a good time. China is an incredible place and Expo is the icing on the cake. I noticed a change in the US Pavilion; when I visited in early May, the canopy for the entry queue was not there. I'm also happy to hear that Expo attendance has reached expected levels. When I visited the Saudi Arabia Pavilion during my visit in May, I had a discussion with one of the pavilion's hosts who was an American employee of Saudi Aramco. He had just attended a meeting of Expo employees and they had been advised that, should attendance not reach expected levels (average was around 350,000 during the week I was there), overall attendance figures would be reduced to 35-40 million. If Expo attendance turns out to be only half of the 70 million originally projected, especially in a country of 1.3 billion inhabitants, the traditional world's fair model might not be considered viable in the future. Speaking of the traditional world's fair model, has anyone taken a close look at the plans for Milan Expo 2015? From what I've seen on the Expo 2015 website, it does not appear to be the size or scope of a universal exhibition. There was a whole section inside the Italian Pavilion devoted to Milano 2015-- with artist's renderings of the site. Shanghai may be a hard act to follow-- but you can't underestimate Italy's flair for design and aesthetic. And I think the next Expo's theme of "Feeding the Planet, Energy for Life" packs a particularly powerful message. Far too early to rule them out. You're right. Italian industrial design is certainly world class. I didn't get into the Italian Pavilion. Like you said, we'll have to wait and see. A new picture of Expo 2010 a day. It sounds like an awesome trip Trey. And it's so great for a World's Fair fan who had never been to one (like myself) could finally attend one in person! You obviously had a whole other level of appreciation for the whole thing because of your interests. Thank you for sharing your experience and photos with us. Also, I just think it's so great that GM is doing a Futurama 3! What a great nod to a successful World's Fair exhibit from the past (twice even!). That must have been an emotional highlight for you. From New York in 1939 to New York in 1964 to China in 2010. GM has really done their part to connect the new to the old. Thanks for the report. I'm sure you're busy but I'd love to hear any other observations that may come to mind. I saw a clip of Futurama 3 which consisted of jumpsuited dancers gyrating around glorified Segways that moved back and forth without rhyme or reason that I could see. Counterrotating Spreewell rims are apparently in store for 2030? I'd rather have the laser jungle cutter. The film that precedes the gyrating dancers explains what those cars are all about. They aren't Segways. They are cars that link with a magnetic system embedded in roadways so the driver need only program origin and destination and be on his way. No driving required. A humorous part of the film shows a pet owner placing his dog into one of these vehicles, programming his vet's address and sending the dog on its way. Didn't Futurama II include magnetically guided cars or were those hooked up to cables like a car wash? The narrowness of the image shows you how wide the screen is, since it is quite tall. Once the film finishes, there is a truly breathtaking moment: the huge curved screen descends into the floor to reveal that there are not one, but four duplicate theaters facing each other! Since you think you're in the only theater, this is a real shock as a massive auditorium is revealed with four audiences (of hundreds each) face each other. But then, they just do what you see in the video linked in earlier posts - dance around the cars! It's an incredibly wasted opportunity. If they had had some performance that even came close to the grand ideas presented in the film (maybe some flying? ), it would have been very impressive. Instead, we get these silly dancers, who actually seem to worship one of the cars at one point, when it's raised up on a pedestal. What a lost opportunity. Still, the reveal was great.